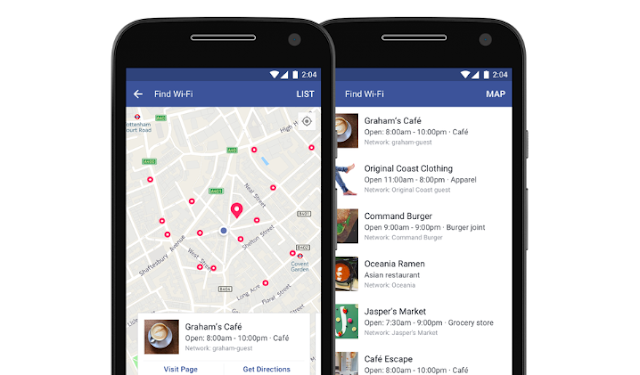 The Facebook new Find Wi-Fi feature is now rolling out globally for Android and iOS. The social network has been testing the feature since last year. As the name suggests, Find Wi-Fi lets you locate available Wi-Fi hotspots nearby that businesses have shared with Facebook from their Page. In order to find Wi-Fi hotspots, traveling you will have to open your Facebook app, click on the More > Turn on Find Wi-Fi. You can then browse the closest available hotspots on a map, and learn more about the businesses hosting them. The Find Wi-Fi feature will be a boon especially for travelers who cannot always find a data connect traveling internationally. Find Wi-Fi requires you to enable Location History. facebook said in a blog post, We launched Find Wi-Fi in a handful of countries last year and found it’s not only helpful for people who are traveling or on-the-go, but especially useful in areas where cellular data is scarce.